A food firm has abandoned its opposition to restrictions on the production of Melton Mowbray pork pies. Leeds-based Northern Foods was fighting an application to give the pie an exclusive European regional status, such as Champagne. It said restricting production to a zone around the town would cause economic damage. The firm dropped its appeal after the government said manufacturers would be given five years to move production. Northern Foods said the company was pleased with the outcome and said the five-year grace period would mean a "level playing field for the industry". The firm had already unsuccessfully challenged the application in the UK courts. 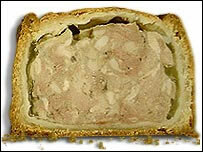 It argued that authentic Melton Mowbray pies had been produced far from Leicestershire for more than 100 years. Matthew O'Callaghan, from the Melton Mowbray Pork Pie Association, said he thought the fight for protected status had nearly been won. The association is backing an application for the exclusion zone, which would take in Grantham, Nottingham and Northampton, that is being considered by the European Commission. "We think we're home and dry. "It (protected status) is important so the consumer knows they're getting a genuine article. "It protects regional foods and is important for jobs in and around the Melton Mowbray area." He said if the application was successful, pie makers would have to ensure the Melton Mowbray pork pie is made from uncured pork, to ensure the inside is grey in colour.